After facing all the tough times linked with bankruptcy and other issues, Spyker re-entered the automotive world at the Geneva Motor Show. Company here took the curtains off its Spyker C8 Preliator 2017. The model features a sportive design that is hand built and has the traits that will attract all the limelight for you. Let us have a look at the review of Spyker C8 Preliator 2017 to know in detail about it. The interior of Spyker C8 Preliator 2017 features a smoothly designed distinct body that we might expect from any hand-built machine. At the head you’ll notice the ivory leather getting contrast with the white stitching in honeycomb pattern. The interior brings for you 14 color options while the steering wheel and instrument cluster brings its own unique saga of beauty. There are four round gauges mounted on the center console. The same gets accompanied by numerous other switches, two HVAC vents and three more circular gauges. There is a heads-up display inside, featuring navigation and other infotainment features. 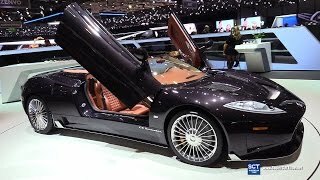 Thus rounding up the interior details of Spyker C8 Preliator 2017 I’ll call it elegant with looks and smooth in feel. 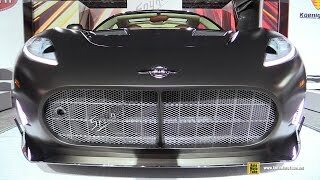 The exterior of Spyker C8 Preliator 2017 can at once be recognized, however a closer inspection will highlight a few changes that are made especially for this new generation model. Starting with the front fascia, it has the traditional massive oval shaped grille sitting amidst the same headlights. However the vertical louver located in center featuring a company’s badge adds to the list of changes. The LED daytime running lights and slim front spoiler with upswept wings give the model most desired aggressive touch. Moving towards the rear end, along the sides of the model you’ll notice the rectangular vents sitting vertically, not only adding to the aerodynamic performance but also the looks. The rear fascia comes with a flat rear lid with a LED strip running through the entire length. The LED tail lights feature LED rings around their stainless steel covering while the dual oval exhaust outlet below and the ‘C8 Preliator’ badge in between gives the model a final touch. 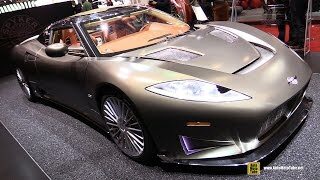 Thus rounding up the exterior details of Spyker C8 Preliator 2017 I’ll call it sportive, distinct and aggressively designed body with all required aerodynamic inclusions. 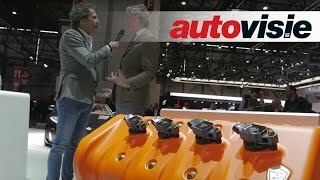 Beneath the hood of Spyker C8 Preliator 2017 sits a 4.2 liter 90 degree V8 engine with VVT and Compressor. The unit produces total output of 517 hp and peak torque of 600 nm mating to six-speed manual transmission. There is also an option to have a ZF six-speed automatic transmission with paddle shifter being mounted behind the steering wheel. 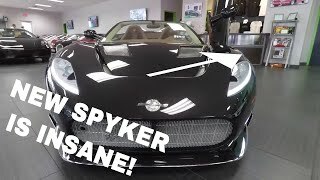 With this power the top speed of Spyker C8 Preliator 2017 touches the mark of 201 mph while the 0-62 mph sprint can be knocked in just 3.7 seconds.